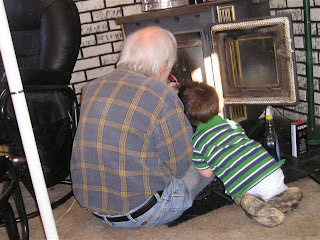 Seth helps Great Uncle Jim clean the pellet stove. At first I thought he was cleaning with his feet, but then realized those are just little camo shoes. Seth is getting to be a BIG boy! Do you think he can come to my house to perform some much needed chores?